Circa 1927, this traditional center hall plan family home located in the coveted Chaplin Estates neighbourhood mixes timeless curb appeal with elegant designer finishes throughout. You will love the charming entrance with extra wide stone front steps and wood archway. The main floor has wonderful entertaining flow and features continuous 4” rift cut and quarter sawn white oak engineered flooring and tons of natural light. The oversized foyer has a beautiful blue stone mosaic inlay, coat closet, and is flanked by the large living and dining rooms. The living room boasts a beautiful wood burning fireplace with floor to ceiling limestone cladding and wood mantel, original stain glass windows, immaculate woodwork, and a light filled office with custom built in bookshelves and beautiful views of the garden. 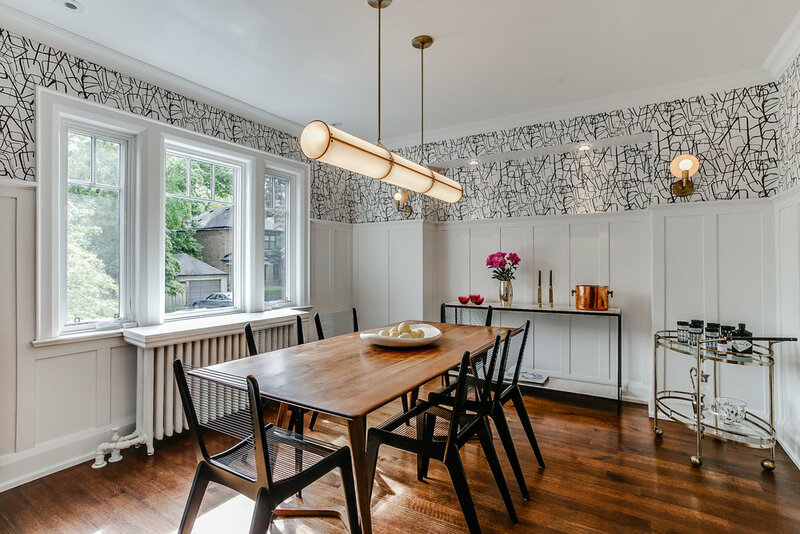 The dining room is an elegant and sophisticated entertaining space that features tons of natural light, Tres Tintas designer wallpaper, and original plate rail. The kitchen is a chef’s dream with the finest appliances and accessories, marble countertops, breakfast bar, farmhouse sink, custom pantry, modern cabinets and shelving with LED under lighting. The kitchen flows directly into the cozy family room which features built in speakers, powder room, and walk out to the wood deck, limestone patio and immaculately maintained backyard. All four bedrooms are located on the second floor and surround the 4-pc bathroom featuring an elegant cast iron under mount bathtub with marble surround and niches, in floor heating, and luxury accessories. The spacious master is a wonderful retreat with in-floor radiant heating, tons of natural light, 3-pc ensuite, walk-in closet, and an additional double closet. The basement has a separate entrance, good ceiling height, custom California closet with built in organizers and ample storage under the stairs. All the lower level rooms are a good size, with the music room featuring a kitchenette and 3-pc bathroom. The adjoining Den has built in bookshelves, a tiled laundry room with high end LG Washer and Dryer, and a bonus work space. The gardens have been extensively landscaped, creating a charming low maintenance retreat complete with an in-ground irrigation system. The fenced in backyard features two dedicated gas lines, one for a Solus River Rock fire pit and the other for a BBQ. Over 12 trees have been planted since 2005 including Beach, Service Berry, Golden Chain, Flowering Pear, Japanese Maples, and Pine. 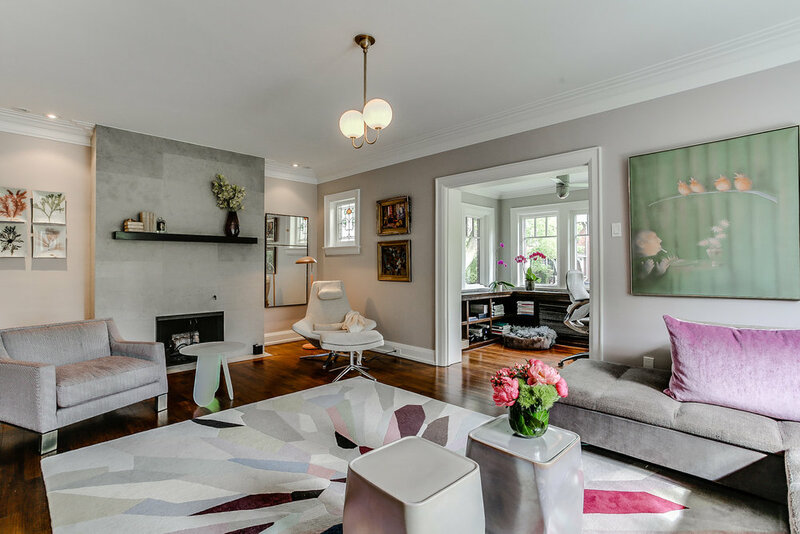 Completed by a private drive with two car parking, surrounded by excellent schools and parks, and a short walk to the shops, cafes, restaurants, and TTC on Yonge St, this truly wonderful family home in the heart of Toronto.